Discussion in 'Released' started by hamstar, Aug 20, 2018. Implements an extensible, paginated inventory for players, able to be increased endlessly. Use the 'Share Page' button to toggle sharing any (stackable) item pickups amongst (shared) pages also containing stacks of those items. Note: In its base form, this is a "cheat" mod, and it will always be. Limitations of use can be implemented via. config or via. the API for game modes, player abilities, special circumstances, or custom items (e.g. a backpack accessory). Ask if you need coding help with this, or to request new API functions. Source available here. API also available. Soaker350, TheWorfer27, Sir AFK and 8 others like this. Well, if you want an API to bind this to an item, I can provide that, and you'll still get your wish. I'm basically doing this with my On A Rail mod's release version. You'd do that? I would like this thank you. Dunno what you have in mind, but I'd love to see some kinda backpack mod. There's currently 2 mods that I know of that kinda fit that theme.. Portable Storage and Bags of Holding. Portable Storage has some bugs (just earlier one of my bags deleted all it's contents), and Bags of Holding requires you to use up accessory slots if you want to auto pickup items into the bags. It also requires you to right click with the bag in the hotbar to access it's inventory. They also have pretty much infinite storage by extending stack size of item types. So I'd personally love to see a decent backpack mod that simply gives you more inventory space, but not infinite space as to keep things balanced, and without the hassle of having to give up accessories or use the hotbar. If that's what you had in mind anyway. It's amazing idea, i love it. Thou a little overpowered? How about another version of the mod where you have to craft an upgrade and use it to add page to inventory? Those upgrades would be harder to craft each time you apply a new upgrade, so it could be limited to for example 10 upgrades or so? DontEatSocks, Mechanos, IDGCaptainRussia and 1 other person like this. Only complaint I have is that only the active/selected page is used rather than the inventory as a whole. Heт and overzero543 like this. Edit: The mod using all the pages instead of just the selected one is almost necessary at least to a certain point, picking up items won't stack them with the same item in a different page which makes working with this mod extremely difficult. Trying to switch pages with a consumable item will also use the item at the same time it switches the page. DontEatSocks, overzero543, LunarRequiem and 1 other person like this. Heт and hamstar like this. 3. 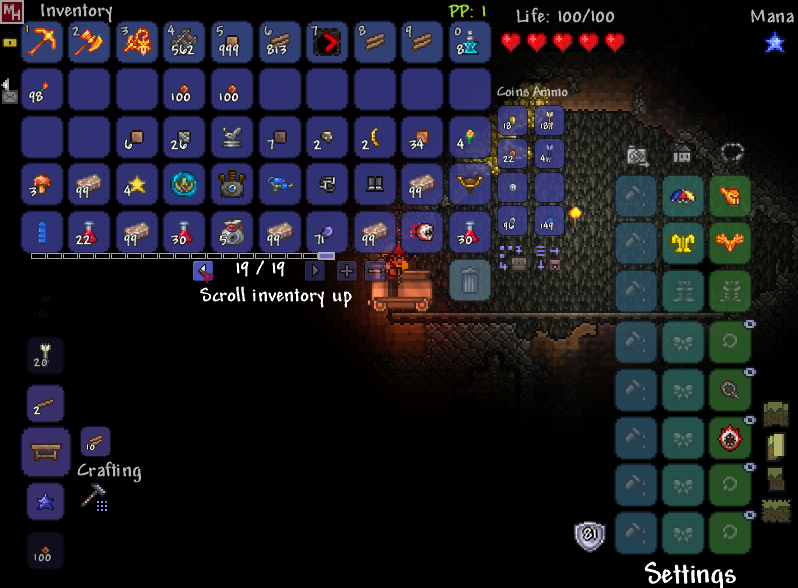 This is the only mod I know of that just lets you choose how much inventory space you have, removing that part and forcing people to use items to increase it (And limiting the amount of pages you can get anyway) would completely leave out anybody else who want's a mod like this (including myself). Knowing Hamstar, we'll very likely get a config file where we can choose the way we want to play the mod. For the record there 'is' another mod that adds more pages, but it's limited to 3 and it's tied into a complete RPG revamp which, has corruption issues. There's already config options for the mod, but the next version will have more, for sure. It's the API, however, where the real options become available. It will be up to modders to make use of that, though. On A Rail will use it, also. Im getting this popup everytime i change equipment tab. How do i fix it? What is your Logs.txt saying, as per the message? We still need it so that the game can use all pages instead of whichever one is currently selected and it still needs to be made so that changing inventory pages with an item doesn't use the item. Hello! Amazing mod, I have been looking for something like this since forever! Thank you so much for making this mod! If it's possible could you please add these features? 1) When clicking on the arrows(<,>) or the + sign my character uses the currently selected item in the hotbar, In general it's not a problem for me but you might want to look into it. 2) Please add the ability to name the pages, The name would appear under the keys (<,>,+). For example dedicating a whole page for weapons only and naming it Weapons, etc. But in general thank you alot for making this mod, its great! v1.1.0 up. I didn't get to the full set of things I wanted to do, but at least the API is now implemented. FiveSix78 and hamstar like this.